Why are advocates for illegal aliens opposed to a border fence? Q. Can fences along the border impede the flow of hordes of aliens who cross the border illegally daily? A. Yes. Many successful fences to keep aliens and other types of intruders out have been built. In San Diego, the 14 mile double layer border fence led to a 97 percent decrease in apprehensions and a corresponding decrease in border crime from 1989 to present. Israel’s border fence has been extraordinarily successful in keeping out potential infiltrators who are far more determined to cross the border than mere immigrants. Even Saudi Arabia, one of the most vocal critics of Israel's "security fence" in the West Bank, has quietly emulated the Israeli example by erecting a barrier along its porous border with Yemen to prevent terrorists from entering. Q. Won't border crossers simply go to where there is no fence? A. That's not an argument against a fence -- it's an argument for a fence across both of the ENTIRE borders (Canada and Mexico). Q. Isn't a fence of such a large magnitude an enormously costly engineering nightmare? A. Building a complete double layer border fence across both borders is inexpensive child's play compared to American engineering feats such as the Panama Canal and Boulder Dam. Q. Can a fence be put across all terrain such as mountains and rivers? A. No. There are some lengths across both borders where a fence is impractical to install. In some cases, a fence would act as a dam by trapping plants and brush when heavy rain waters or melting snow flows. But those unfenced lengths of rough terrain are natural barriers that aliens would not easily cross. Moreover, those impassable areas are more easily monitored by the border patrol with hi-tech unmanned lookout posts. Q. Won't a border fence be environmentally unfriendly? A. A border fence can be built to minimize environmental problems. A fence will not only impede the flow of illegal aliens, but will also impede the flow of terrorists. Worrying about minor environmental problems at the border is like worrying about who will fix the potholes after an earthquake. Q. Why do opponents of border fences compare it to the Great Wall of China saying that China's enemies still managed to enter china? A. Just as any border barrier will not prevent 100 percent of intruders from crossing it, the Great Wall of China did in fact keep China safe from large invading armies. Q. Why do opponents of border fences compare it to the Berlin wall? A. Such a comparison is even an insult to the intelligence of dummies. When you build a wall to keep people in, that’s a prison. When you build a fence to keep people out, that’s securing your sovereignty. Would you compare a fence around your house to control who comes into your yard to the Berlin wall? Moreover, the proposal by congress was for building of a "fence," not a "wall." Q. What's the difference between a fence and a wall? A. A wall is a thick solid structure through which you cannot see. A fence is a thin structure that you can see through to the other side. Q. Wait a minute. Isn't the section of border fence which separates Naco, Mexico from Naco, Arizona one that you cannot see through? A. Yes. And there are many more border fences just like the Naco fence. Sometimes the government does stupid things like building fences through which the Border Patrol cannot see. Illegal crossers poke holes in the fence to watch for border patrol officers. When the coast is clear, they simply scale to the top on the Mexican side sometimes using ladders and drop down on the U.S. side sometimes with ropes. Successful border fences must be able to be seen through. Speaking of government doing stupid things, this section of border fence which separates Douglas Arizona from Agua Prieta has the iron bar tips pointing away from Mexico. According to Rick Oltman of CAPS (Californians for Population Stabilization), when he asked a staffer at Arizona Senator John McCain's office why the tips were pointing towards the U.S., he was told that they didn't want to offend Mexico. Q. Why not save all that money to build a physical fence by instead, building a "virtual" fence? A. There is no such thing as a virtual fence? A physical fence physically impedes aliens from crossing. A so called virtual fence does not. What is referred to as virtual fences, are video cameras and invisible arrays of sensors along the border. When a sensor is triggered, a display appears at the Border Patrol station which tells the station officers in real time when and where aliens are crossing. But effective physical fences also use detection apparatus. Q. So what's wrong with a virtual fence? A. The problem at the border is not the inability to electronically detect intruders -- the problem is getting to them and arresting them once they are detected. Large numbers of up to one hundred aliens can quickly cross an invisible virtual fence (the crossing of such groups are known as Bonzai charges). Intruders crossing a virtual fence are not aware that they have been detected and keep moving on at a rate of about two miles per hour. By the time the border patrol gets to the point of detection, the crossers aren't there. Thus, the arriving border patrol officers must radio for helicopter help to search the area. At the same time other border patrol resources are dispatched to other trails and paths that the crossers MIGHT use. The border patrol is usually successful in apprehending some of the group, but are too overwhelmed to apprehend all those in a large group. Smugglers know how the border patrol works, so while all border patrol resources in the area are being used going after just one group, other groups cross almost unnoticed. With a physical fence, a large group is easily detected just as with a virtual fence, but it takes time to climb a fence. Thus, the border patrol can get to the fence in time to intercept most of the crossers. Q. Why bother with a physical fence that apparently is easy to get over using a ladder and rope? A. Using a ladder and rope to get over a fence is not easy if the fence is a double layered fence as the 700 mile fence is supposed to be. With a double layered fence, a crosser would have to lift the ladder up with him to the top of the fence, lean it against the other side of the first layer, climb down the other side of the first layer and then repeat the process to climb the second layer and would have to leave the ladder behind. For a large group, two ladders would have to be in place -- one ladder against the first layer and second latter against the second layer. A large group would have to climb the first ladder, drop down on the other side of the first layer with a rope and repeat the process for the second layer. A large group trying to hurdle two layers of fence in single file, gives border patrol officers plenty of time to intercept all or most crossers. Q. How much double layered fence has been built to date so far? Q. I don't get it. On December 15, 2008, Michael Chertoff, then Secretary of the Department of Homeland Security claimed that 500 miles of fence had been built. Isn't this in conflict with American Border Patrol's figure of 40 miles? A. Although congress originally mandated that the entire fence be double layered, Texas Senator Hutchison introduced and passed a Border Amendment which virtually gutted the original fence bill. The amendment required Chertoff to use double layer fence only in more smuggler troublesome areas but allowed the use of single layer fence where Chertoff determined it was adequate. But not only did Chertoff use single layer fence where he thought it adequate, he had vehicle barriers which do not impede pedestrian movement built in place of fencing and left existing inferior fencing in place in many locations. Chertoff came up with his 500 mile figure by adding any newly constructed double layer fencing (40 miles) plus newly constructed single layer fencing plus vehicle barriers plus existing fencing. Watch ABP video which documents the "border fence scam." Q. Hal, have you verified the border scam for yourself? A. Yes. Watchdog America's satellite office is located within walking distance from the fence along the border separating Sonora, Mexico and Palominas, Arizona. Here is just one example of what Homeland Security isn't telling the public. Q. So is the border fence a failure? A. On the contrary. Although the Bush administration saw to it that the fence be designed and constructed to fail, to their's and the Obama administration surprise, it is working to a great extent despite its shortcomings and has caused the drug cartels to fight over remaining routes where there is no fence or inadequate fencing. So the Obama and the Democratic congress realizing that the fence works, they are determined not to finish it. Q. Why hasn't the main stream media reported the truth on the border fence? A. The only organization that has been reporting the truth on the border fence is American Border Patrol. It is no secret that the N.Y. Times, the L.A. Times, the Chicago Tribune and a myriad of other main stream news media are in lock step with President Obama and the majority of Democrats in congress who favor open borders. These media have enacted a virtual news blackout on American Border Patrol. Q. Why do some people insist that a fence alone won't fix the problem? A. They are right that a fence alone won't fix the (entire) problem. But that doesn't mean that if you can't fix the entire problem all at once, that you shouldn't fix part of the problem to begin with. Wouldn't you expect a doctor to first stop the hemorrhaging from an opening in a patient's body before fixing the cause of the hemorrhaging? Q. Won't a border fence offend Hispanics? A. There should be no American offended by a fence to secure our country. American Hispanics are AMERICANS. Q. Shouldn't our government work together with the Mexican government to more harmoniously construct a fence? A. No. As American citizens, we influence our elected leaders to reflect political policies in our national interest. As American citizens, we can't influence by vote, Mexican foreign policy. Mexican politicos do not make policy in the interest of the U.S.
Q. With the facts presented in this Q. and A., Why would anyone be opposed to a border fence? A. Let's be honest. The majority of those opposed to a border fence, really don't want it because they want the border open to illegals, who will be future Democrat voters whose demographics will render the Republican party extinct. Q. So why would anyone in the federal government and the Department of Homeland Security be opposed to a border fence? A. Because the Obama administration and most Democrats know it works. Hal Netkin's keen awareness of the fence solution results from the analytical analysis in great part by American Border Patrol and observation of actual crossings by illegal aliens. In 2006, congress approved and President Bush signed into law, the construction of a double layer border fence at least 700 miles long which was to be completed by May of 2008. At this writing (July, 2014), only 40 miles of "double layer" fence have been completed. So why does the Department of Homeland Security tell us that they have completed 600 miles of fence? 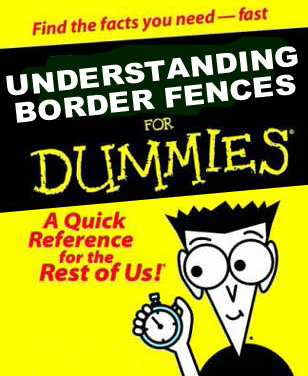 Let's learn about border fences and examine the facts.